MMA Offshore announced earlier today that it has been awarded a contract by Woodside to provide accommodation and walk-to-work vessel services to support platform maintenance operations on Woodside’s Australian assets over two scopes scheduled to commence in April 2019. The MMA Pinnacle, a Multi-Purpose Support Vessel (MPSV) will be fitted with a bespoke motion-compensated gangway system which will enable the safe and efficient transfer of personnel between the Woodside platforms and their accommodation on the vessel during the maintenance programme. The gangway system, based around a custom-built pedestal and a Safeway motion-compensated mast and gangway, offers excellent workability at the significant and variable platform heights required. MMA’s experienced in-house engineering team worked closely with Woodside and Safeway, a specialised gangway manufacturer based in the Netherlands, to design and fit the system to the MMA Pinnacle. This contract award is a testament to MMA’s marine expertise and our ability to work in close partnership with our clients to deliver optimised marine solutions and paves the way for an innovative, safer and more efficient approach to platform maintenance logistics in the region. The MMA Pinnacle, which is on a long term structured contract with i-Tech 7, the Life of Field business unit of Subsea 7, is also permanently fitted with two identical Centurion SP Work Class WROV Systems capable of working in up to 3000m and has an approved Safety Case for operations in Australia which is owned by i-Tech 7. 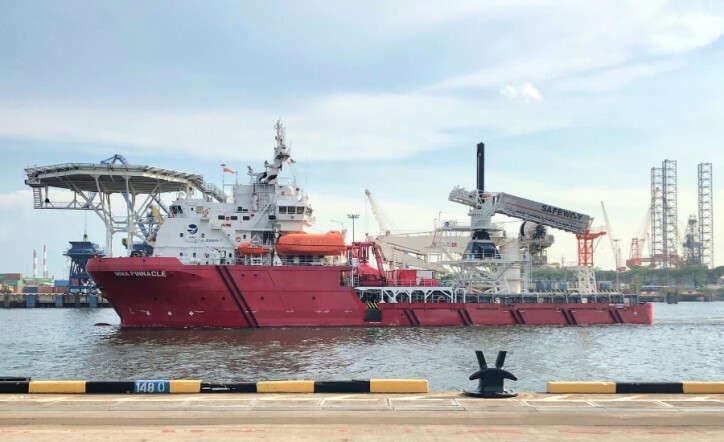 The vessel is also fitted with a 150t active heave compensated subsea crane capable of reaching depths of up to 3,000m making the vessel a very versatile asset for the region.